Building Ghana's bamboo bikes Jump to media player The BBC's Suzanne Vanhooymissen talks to some bamboo bike builders in the Ghanaian city of Kumasi. Toxic legacy of e-waste in Ghana Jump to media player David Reid travels to Agbogbloshie, Ghana to meet the people who make a living from sorting toxic e-waste. Ghana's capital Accra has a reputation for poor waste management, but is trying to turn this to its advantage - recycling human waste into cooking fuel. Accra has been numbered among the world's most polluted places because of an unregulated dump that now forms part of a sprawling slum. And with no proper drainage or sewage system, the city's four million residents are also left to rely on a series of open sewers and polluted waterways. These drain the toxic sludge back into the sea. A lack of toilets and indiscriminate disposal of waste are partly to blame. In Paris, the UN is hosting a major conference seeking ways to limit climate change. 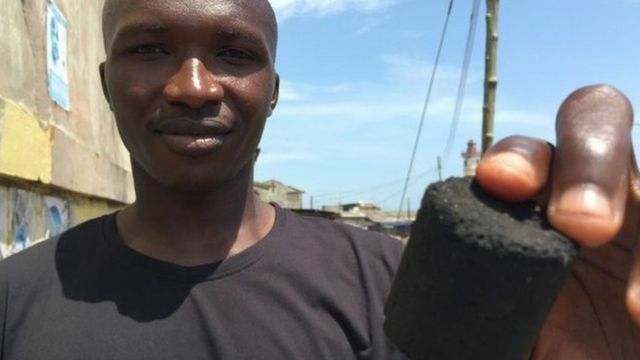 But 6,500km away, in Accra, an enterprising team is taking these matters into its own hands - turning human excrement into cooking fuel. The BBC's Sammy Darko reveals a small scale scheme that has ambitions to go country-wide.